IKRC Grand Canyon has a wide variety of accommodation options. Staying onsite allows you to fully immerse yourself in the Festival experience. Must be booked for the entire Festival: September 27-October 3 (6 nights), except for outdoor camping which can be booked for a minimum of 3 nights. Quad, 5 Shared and 6 Shared Rooms, are booked per room. The person booking is responsible for the full payment and for finding their own room-mates. Full payment due by 12 September on all accommodation except outdoor camping. This is non-refundable after this date unless we are able to re-sell accommodation. The official off-site accommodations for the Festival consist of eleven hotels in the Flagstaff area and a campsite in the Williams area. Each hotel has been selected for its quality, price, nearby amenities and its ability to enhance the Festival experience. Although there are many other hotel options in Flagstaff and Williams, their quality and price cannot be guaranteed. The Festival experience extends beyond the Festival site, and includes the quality of the accommodation, convenience, transportation and visitor and sightseeing opportunities. For these reasons the Festival hotels have been selected in the Flagstaff area. Although Flagstaff is a little further from the site than Williams, it was chosen for our Festival hotels because of its size, amenities, and many shopping and sightseeing options within walking distance of the Festival hotels, or within easy access via public transportation. Wherever you are in Flagstaff, you have breathtaking views of the ponderosa pine forest and the San Francisco mountain peaks, including Humphreys Peak, the highest point in Arizona at 12,633 feet (3,851 meters). Flagstaff is sometimes called the City of Seven Wonders due to its proximity to seven natural monuments and places of beauty. It is an easily commutable town with excellent public transportation. The Westside of Flagstaff hosts Northern Arizona University. This area hosts many shopping centers, grocery stores, restaurants and coffee shops. The three Festival hotels listed below are all within walking distance of each other. The Baymont is a 2 star budget hotel located on the westside of Flagstaff near Northern Arizona University. It offers cozy rooms and is conveniently located with easy and walkable access to local shops, restaurants and supermarkets. The public bus stop is a few minutes walk from the hotel offering easy access to Flagstaff, including a 10-15 minute bus ride to downtown Flagstaff. Must be booked for the entire Festival: September 27-October 3 (6 nights) through the Festival booking system. Quad rooms have two full/double beds (4 people). Triple rooms have two full/double beds Twin rooms have two full/double beds (2 people). Double/Single rooms have a king bed (1-2 people). Rooms are ensuite and include a microwave and refrigerator. Children (18 years and younger) are welcome, but only up to 2 people (of all ages) are allowed in rooms with one bed and up to 4 people (of all ages) are allowed in rooms with two beds. No rollaways or extra beds available. Cribs and play-pens are available on a first come, first serve basis. The hotel has two floors with an elevator. Accessible rooms are available with a roll-in shower. The hotel is a 25 minute drive to/from the Festival site. More information about hotel shuttles coming soon. All reservations are per room. The person booking is responsible for the full payment and for finding their own room-mates. Must be booked for the entire Festival: September 27-October 3 (6 nights). Do not contact the hotel directly. Festival rates are only available when booking through the Festival booking system. You will be required to show your passport (non-US citizens) or drivers license (US citizens) at checkin. A credit card must also be registered for each room – guests are liable for any incidental charges. 25% initial deposit due on booking is refundable up to 15 August 2019. Full payment due by 12 September 2019– non-refundable after that date unless we are able to re-sell room. Failure to pay the deposit or balance payment by the dates indicated above will lead to the cancellation of your accommodation booking. Due to the terms of our contract, there is no flexibility on this. Should we have to cancel your hotel booking due to nonpayment, any subsequent booking will be subject to availability and will be charged at the prevailing room rates and not at the special Festival rate. The Courtyard by Marriott is a 3-star hotel located on the westside of Flagstaff near Northern Arizona University. This recently renovated hotel offers spacious, modern rooms. The large, open lobby includes a restaurant, lounge and coffee shop, and provides plenty of comfortable seating to spend time with friends. It is located just minutes by foot to local shops, restaurants and supermarkets. The public bus stop is just a few minutes from the hotel, offering access to Flagstaff, including a 10-15 minute bus ride to downtown Flagstaff. Double/Twin rooms have a king bed and pull-out sofa (1-2 people). Twin rooms have two queen beds (2 people). Quad/Triple rooms have two queen beds (3-4 people). Rooms are ensuite and include a refrigerator. Breakfast is not included. A variety of breakfast items are available in the bistro located in the hotel lobby. Restaurants that serve breakfast are within walking distance of the hotel. No charge for children (18 years old and younger) when using existing bedding. Rollaways and extra beds are not available. Limited cribs are available on a first come, first serve basis. The hotel has three floors with an elevator/lift. Accessible rooms are available with a roll-in shower. Full payment due by 16 August 2019– non-refundable after that date unless we are able to re-sell room. Springhill Suites by Marriott is a 3-star hotel located on the westside of Flagstaff near Northern Arizona University. This modern hotel offers large, stylish rooms with a comfortable seating and desk area. All rooms also include a trundle (pull-out) bed. The hotel is located just minutes by foot to local shops, restaurants and supermarkets. The public bus stop is just a few minutes from the hotel, offering access to Flagstaff, including a 10-15 minute bus ride to downtown Flagstaff. Single/Double/Quad rooms have a king bed and trundle (pull-out) bed (up to 4 people) and 6 Share rooms have two queen beds and trundle (pull-out) bed (up to 6 people). Hot/cold continental breakfast is included. The hotel has five floors with an elevator/lift. Accessible rooms are available with a roll-in shower. The Eastside of Flagstaff is a rapidly developing area. The Quality Inn, Rodeway Inn & Suites and the Holiday Inn Express are all located right off of Interstate 40 and are within walking distance of each other. Many restaurants and grocery stores are within walking distance of these hotels. The Hampton Inn & Suites, Fairfield Inn & Suites, and Sonesta ES Suites are all within walking distance of each other and are located in the Country Club area on the Eastside. These hotels have fewer local amenities but are surrounded by exquisite views. It is just a quick bus or car trip from this area into the heart of Flagstaff. The Quality Inn on East Lucky Lane is a 2-star hotel located on the eastside of Flagstaff. This hotel offers affordable and comfortable rooms. There are multiple restaurants and grocery stores within walking distance of the hotel. There are multiple public bus stations nearby, giving guests access to Flagstaff, including a 5-10 minute bus ride to downtown Flagstaff! Quad/Triple rooms have two queen beds (3-4 people per room). Twin rooms have two queen beds (max 2 people). A hot/cold continental breakfast is included. Children (18 years or younger) are welcome, but all room types can only have 4 people (of all ages). Infants staying in transportable cribs can stay at no additional cost. Rollaways, extra beds or cribs are not available. The hotel has two floors with stairs (no elevator/lift). All rooms have bathtubs with handbars. No walk-in or roll-in showers available. The hotel is a 35 minute drive to/from the Festival site. More information about hotel shuttles coming soon. The Rodeway Inn & Suites on East Butler Avenue is a 2-star budget hotel located on the eastside of Flagstaff. This hotel offers comfortable accommodations. It is conveniently located with restaurants and a grocery store within walking distance. The hotel is located near multiple public bus stops giving access to Flagstaff, including a 5-10 minute bus ride to downtown Flagstaff! Quad/Triple rooms have two queen beds (3-4 people per room). Double rooms have one king bed (2 people per room). Single rooms have a king bed (1 person per room). Breakfast is not included. Hotel guests receive a 10% discount at the Country Host Restaurant next door (open for breakfast, lunch and dinner). No charge for additional children (18 years and younger) staying in the room as long as they use existing bedding. Extra beds and rollaways are not available. A limited number of cribs are available. The hotel has two floors with stairs (no elevator/lift). On the ground floor, accessible rooms are available with a roll-in shower. The hotel is a 30 minute drive to/from the Festival site. More information about hotel shuttles coming soon. 25% 2nd deposit due on 16 August 2019. Total paid (50%) is non-refundable from this point in case of cancellation, unless we are able to re-sell the room. The Holiday Inn Express is a 3-star hotel located on the eastside of Flagstaff. This hotel offers spacious, modern and comfortable accommodations. It is conveniently located with restaurants and grocery stores within walking distance of the hotel. There are multiple public bus stops near the hotel providing access to Flagstaff, including a 5-10 minute bus ride to downtown Flagstaff. Quad/Triple rooms have two queen beds (3-4 people). Twin rooms have two queen beds (2 people). Children are welcome, but only up to four people (of all ages) are allowed in all room types. Cribs for infants are available. The hotel has five floors and has an elevator/lift. There are hearing accessible rooms and wheelchair accessible rooms with roll-in showers. The Hampton Inn & Suites Flagstaff East is a 3-star hotel. 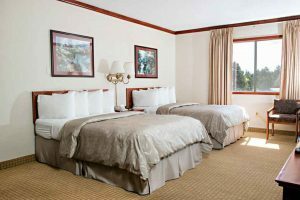 This brand new hotel is located on the eastside of Flagstaff in the country club area and is surrounded by stunning nature views. It offers large, modern and comfortable rooms. There are few restaurants within walking distance, but there is a public bus stop a couple minutes from the hotel giving access to Flagstaff, including a 20 minute bus ride to downtown Flagstaff. Quad/Triple rooms have two queen beds (3-4 people). Twin rooms have two queen beds (max 2 people). Double/Single rooms have a king bed and full/double sofa bed (1-2 people). Children (18 years or younger) are welcome, but all room types can only have 4 people (of all ages). Infants staying in “pack n’ plays” or transportable cribs can stay at no additional cost. Rollaways and extra beds are not available. “Pack n’ play” for infants are available on a first come, first serve basis. The hotel has four floors with an elevator/lift. There are hearing accessible rooms and wheelchair accessible rooms with roll-in showers. Because this is a new facility, it meets all current ADA requirements. Quad/Triple rooms have two queen beds (3-4 people). Twin rooms have two queen beds (max 2 people). Double/Single rooms have a king bed (1-2 people). Children (18 years or younger) are welcome, but rooms with two queen beds can only have 4 people (of all ages) and rooms with one bed can only have 2 people (of all ages). Infants staying in “pack n’ plays” or transportable cribs can stay at no additional cost. Rollaways and extra beds are not available. “Pack n’ play” for infants are available on a first come, first serve basis. 6 Share suites have two king bedrooms with a full/double sofa bed in living room (max 6 people), plus full kitchen and two bathrooms. Triple suites have one king bed plus a sofa bed (3 people) with full kitchen. Double/Twin/Single rooms have one king bed plus sofa bed (1-2 people) with full kitchen. All rooms include a fully-equipped kitchen. A hot continental breakfast is included. Light complimentary dinners are provided Tuesday-Thursday evenings. Children (18 years and younger) are welcome, but only 6 people (of all ages) are allowed in the suites with two king beds and sofa bed, and up to 3 people (of all ages) are allowed in the one king bed and sofa bed suites. No rollaways, extra beds or cribs available. The hotel has two floors with stairs (no elevator/lift). Accessible rooms with roll-in showers are available. 25% initial deposit due on booking is refundable up to 18 July 2019. Full payment due by 19 July 2019– non-refundable after that date unless we are able to re-sell room. Downtown Flagstaff, with many restaurants and an eclectic mix of shops, is a 10 minute walk away. A grocery store is within walking distance of the hotel. A public bus stop is located within 5 minutes of the hotel, allowing easy access to the rest of Flagstaff. Early arrivals and late stays are not available with your Festival booking and must be booked directly with the hotel. Single rooms have a queen bed (max 1 person), double rooms have a king bed (max 2 people), and Triple/Quad rooms have two queen beds (up to 4 people). Outdoor pool and patio are available. Children are welcome, but only up to 2 people (of all ages) are allowed in the rooms with one bed and up to 4 people (of all ages) are allowed in the rooms with two beds. Extra beds, rollaways and cribs are not available. The hotel consists of two separate buildings with two floors and stairs only (no elevator/lift). The hotel does not have accessible rooms. The Days Inn West Route 66 is a 2-star budget hotel located on Route 66 on the westside of Flagstaff near downtown. The hotel is a throwback to the heyday of Old Route 66. It offers comfortable twin rooms. The large hotel lobby is a great place to hang out and offers a foosball table and pool table. Restaurants, shops and a supermarket are within walking distance. Downtown Flagstaff is a 25 minute walk or 10 minute bus ride away. Quad/Triple rooms have two queen beds (3-4 people per room). Twin rooms have two queen beds (up to 2 people). Children (18 years old and younger) are welcome, but no more than 4 people (of all ages) are allowed in each room. Rollaways, extra beds and cribs are available on a first come, first serve basis. The hotel is one floor. Accessible rooms are not available at this hotel. 25% initial deposit due on booking is refundable up to 3 August 2019. Known as the Gateway to the Grand Canyon, Williams provides an eclectic mix of Americana – cowboys, railroad and 50s nostalgia! Route 66 is the main street through town, with six blocks of local shops and restaurants. Williams is surrounded by the Kaibab National Forest, with many options for outdoor activities. The Circle Pines KOA is located between the Festival site and Williams (5 miles outside of downtown Williams). The campground offers the Bear Trax cafe, which is open for breakfast and dinner. There is also a small store onsite providing groceries and camping supplies. The campground is a 10 minute drive into Williams, where there are restaurants, local shops and a grocery store. Breakfast is not included, but breakfast can be purchased at the Bear Trax Cafe. Groceries are also available in the shop at the front desk. Children are welcome, but only the maximum number of people are allowed in each accommodation type. Cribs, rollaways or extra beds are not available. This is a rustic location with less accessibility. The deluxe cabins are ADA compliant. Please contact Festival Registration for more info. The campground is a 10 minute drive to/from the Festival site. More information about hotel shuttles coming soon. Sleeps up to 6 people in two bedrooms (2 bunk bed sets, 1 full/double bed), linens are not provided so bring a sleeping bag, pillow and towel, heated, no kitchen or bathrooms in the cabin (bathroom facilities nearby). Sleeps up to 4 people (1 bunk bed set, 1 full/double bed), linens are not provided so bring a sleeping bag, pillow and towel, heated, no kitchen or bathrooms in the cabin (bathroom facilities nearby). Sleeps up to 5 people closely (1 bunk bed with a full/double size bottom bed and twin size top bed and 1 queen bed), linens provided, mini-fridge and small heater provided. Bathroom facilities nearby. All reservations are per cabin/cottage/teepee. The person booking is responsible for the full payment and for finding their own room-mates. Do not contact the camp directly. Festival rates are only available when booking through the Festival booking system.